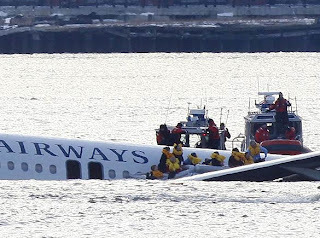 The world was both impressed and relieved by the miraculous outcome of Flight 1549's ditching in the Hudson River this week. To be sure, an amazing number of things went right for both the crew and the passengers. That aside, there are a number of business lessons we can extract from this accident, and several of them might make some useful "word pictures" to help your management team understand the fundamentals of business planning and strategy -- particularly when things take an unexpected turn. First, the advantages of luck and good timing can never be discounted. Most business owners, if they're honest, can cite one or five or ten incidents of either good luck, good timing, or both that have propelled their businesses forward. Never discount luck or timing, and never fail to capitalize on either luck or timing, should they befall you. But back to what Capt. Sullenberger and his First Officer could control. A great saying among pilots is "You never want to run out of airspeed, altitude and ideas all at the same time." The business analogies? Airspeed is a lot like cash flow, and altitude is a lot like size and scale (business volume). And ideas are ideas -- the "do-differents" that are essential when you're running out of airspeed and altitude. So, what actually happened in this accident? First, a completely unforseeable event -- a bird strike taking out BOTH engines. The luck part was that it wasn't 30 seconds or a minute earlier -- they had been able to get just over 3,000 feet of altitude -- with few feet to spare for the landing they pulled off. The crew figured out immediately that with no engines, more altitude was not an option, and then made an instinctively correct decision -- putting the nose down, hastening their descent, but maintaining (or perhaps even gaining) airspeed. Not bad luck, either, that Sullenberger's experience included certification in gliders -- he was no stranger to flying an unpowered aircraft. This was a critical and experience-based decision (remember he was also a fighter pilot). A less experienced hand could have easily stalled the airplane, and simply fallen out of the sky like a rock. And then they quickly discarded unworkable ideas -- forget LaGuardia, forget Teterboro. Forget any expanse of unpopulated land -- there aren't any in NYC. And then they communicated their intentions -- they radioed the tower and said "We're gonna be in the Hudson." Another good call, giving the Coast Guard and others a couple of minutes advance notice to start their response. Finally, they communicated with the passengers and flight attendants: "Brace for impact." They didn't have to say that twice -- the flight attendants took over and repeated and amplified that message in the cabin. And on final approach, that glider experience kicked in and they landed "tail first", bringing the plane to a near-stall (and minimum ground speed) just as it hit the water. They remembered also the pilot's axiom "keep your wings level" -- perhaps the single thing Sullenberger absolutely had to get right -- dropping those two engines into the water at precisely the same time, unlike most water landings where one wing dips, catches the water, and the plane cartwheels into pieces. Let's also not forget luck -- that a calm, shallow-water channel was available and that it also happened to be surrounded by boats already underway that were able to take on survivors in minutes. Just 15 minutes of additional delay would have claimed several lives to hypothermia in the frigid water. Assuming you still have some altitude (cash) left, maintain airspeed (revenue) at all costs. Without that, the game's over quickly. Point the nose down -- to maintain critical airspeed (enough revenue to cover reduced expenses). And do it quickly, before you stall. Ideas -- The stock in trade of Chief Executive Boards International. If you're running out of ideas, reach out to others (such as CEBI members) who may have experience, training or instincts you don't have. Keep your wings level -- Keep your objectives, strategies and values in focus. Despite adversity, your employees want to see you consistent and level in your thinking and decision-making. They may not like the decisions you make, but they'll respect them if they're consistent and steady, rather than erratic. Communicate -- Let your key managers know exactly what's going on. They can be part of the solution if they understand the problem. And, of course, you should expect them to repeat and amplify the message to the troops. I hope you can use some of these ideas or "word pictures" to explain what you're doing and why to either your management team or employees. Sometimes metaphors work best in communicating unfamiliar or abstract ideas. Perhaps you see some more business lessons in this accident. Would you click "Comments" below and share them with others?